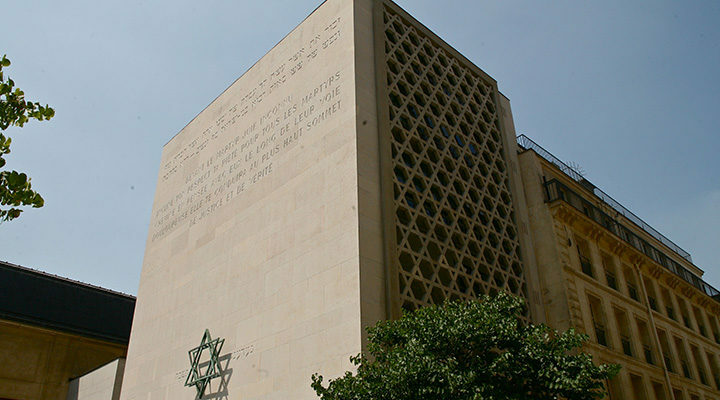 Located in the heart of the historic Marais district in Paris, the Shoah Memorial offers visitors many resources and activities in a total surface area of nearly 5,000 square meters. Explore the various spaces that make up the site. The stone-clad façade forms a 14-meter-high blind wall with two engraved inscriptions. In Hebrew: “Remember what Amalek did unto our generation, which exterminated 600 myriad bodies and souls even though there was no war” (adapted by the great Jewish poet Zalman Schneour from Deuteronomy 25:17). In French: “Before the Unknown Jewish Martyr, bow your head in piety and respect for all the martyrs. Walk beside them in your thoughts on their long , painful road. It will lead you to the highest summit of justice and truth” (Justin Godard, former minister, Honorary President of the Committee of the Unknown Jewish Martyr). USEFUL INFORMATION: The façade can be seen when the Memorial is open but also from the outside.